Importing Data from Other Software. Form the Model and Contour the job. Import road alignments designed in a CAD package. Use the alignments to interpolate profiles and sections. Start CDS and use File New to start a new job called ‘import’. If you look at the adjacent screen you will see that I have simply typed in ‘import’ and have not worried about the *.cdsdat that CDS appears with in the first place. I have also typed in a job description so I will have a little more information to identify the job with, and I recommend that you get into this same habit of always supplying at least a description with each new job you open. Once you select Open, the program will display a blank job screen ready for you to proceed. Since we will only be working with one job, you should maximise the screen. You have been sent a file from your colleague who did the field survey, and in this case she has told you that she has supplied you with a civilcad ASCII file called ‘surface1.asc’. In real life you might equally have been given a MOSS Genio, or a Geocomp file. What is important here is to learn the process so that you can later apply it to particular circumstances, and the process is essentially the same regardless of the origin of the file you need to import. The first step in the process is to import the file called ‘surface1.asc’. Pull down the File menu, and select Import. 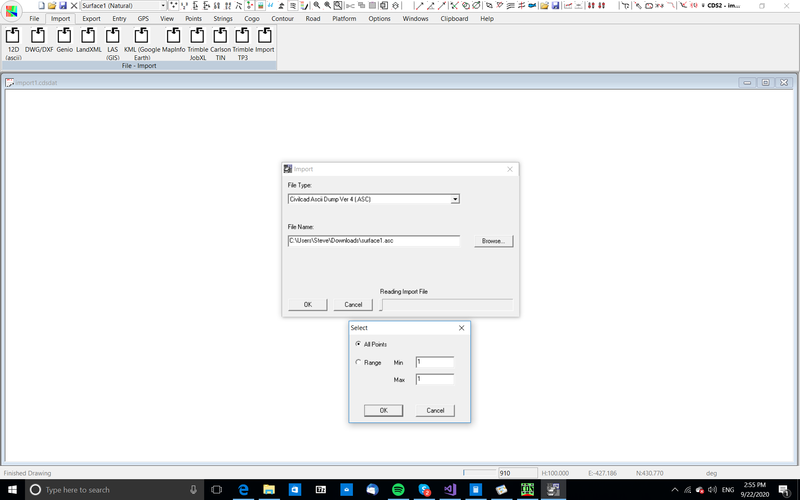 Use the pull down File Type option to select a Civilcad ASCII File Ver 4. Use the Browse button to look in the folder \foresite\tutor, and you should see a file named ‘surface1’ appear in the search window. Pick this file and then select OK.
CDS will ask if you wish to import all or a range of the points in the file, and you should make sure All is selected, and then press OK.
You will see the action bar along the bottom fill in as the points are imported. Next CDS will inform you that it has found strings in the ASCII file, and ask if you wish to import them. Select Yes. CDS will now ask you to provide a string folder to store these strings in. 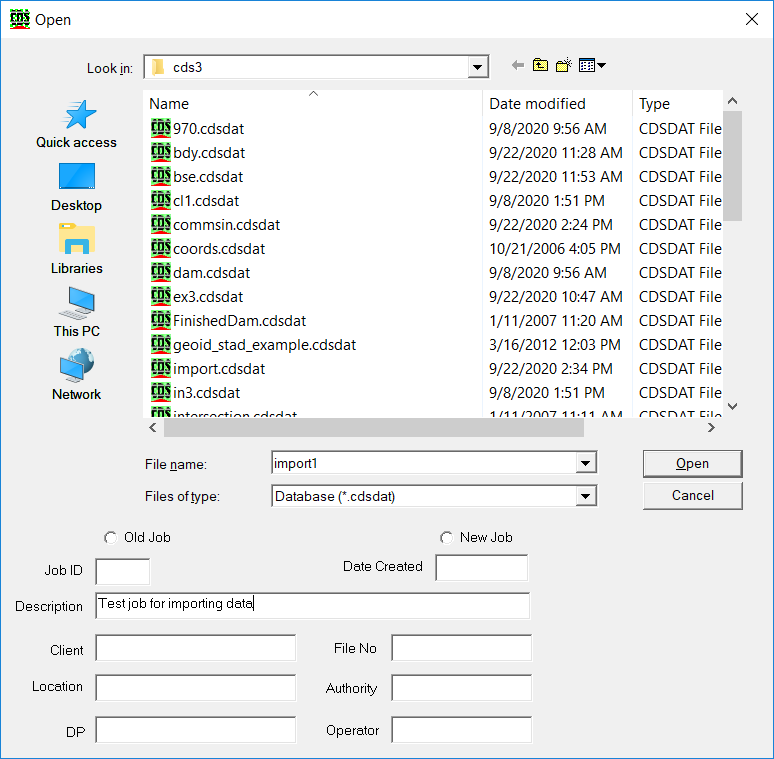 The folder name is of no great importance, as long as you use a name which makes sense, and here, since the strings have originated in the field, I suggest a folder name of ‘field’, as you can see from the screen above. 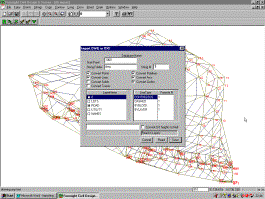 Once you have supplied the name, the program will commence importing the strings, and when it is finished you should see a mass of points appear in the center of the screen. Use Zoom Extents to zoom to the full screen view of the job, and you should now see a screen like that at right. At this stage you need to form a contoured model, and while these steps should be very familiar to you by now, I will repeat them to reinforce your memory. 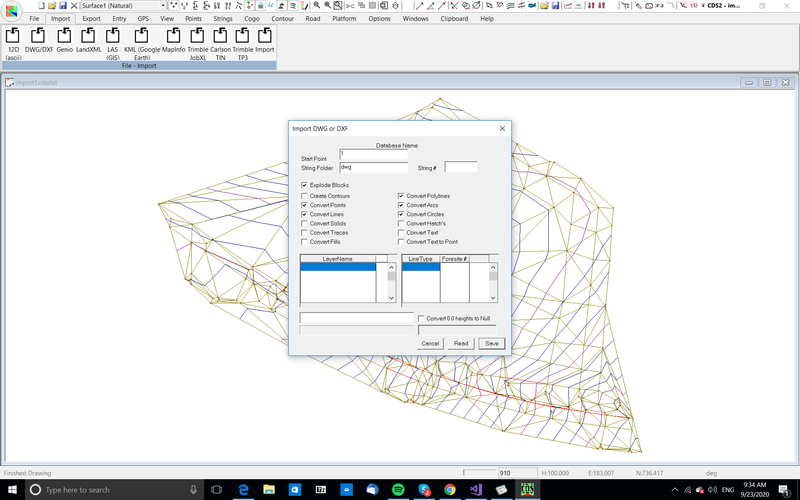 Pull down the Contour menu, Select Surface parameters and rest to pick up the extents of the job. Now change the Major Contour interval to 2 metres, and the Minor Interval to 0.5. 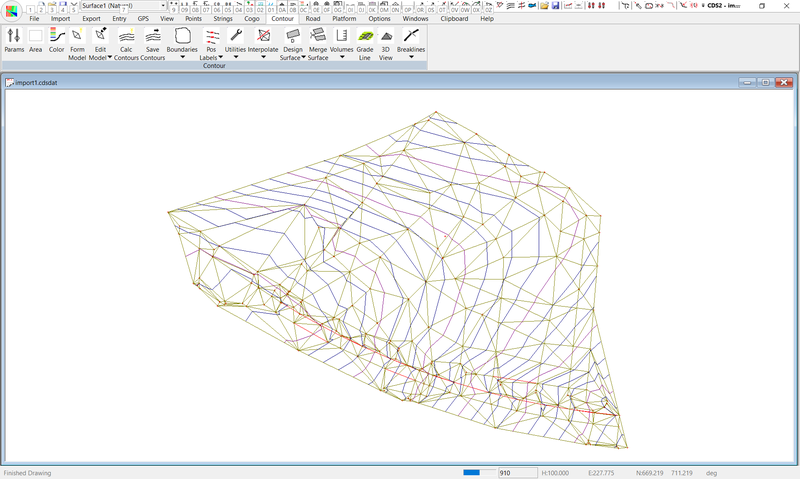 Pull down Contour, Select Surface area, and select Extents. Next form the Model. Calculate and store the contours and you should see a screen similar to that at right.There is obvious work to do in removing long triangles on the left of the job, and assorted other titivation , but that is of no interest to us here, and we move on to importing the design layout from the CAD package. It is common to be given a CAD drawing which has the design layout that you need, and you will need to import that information into CDS. Please NOTE that it is important to try and ‘control’ this information at the CAD stage if you possibly can, because it can save you hours of subsequent ‘sorting out’. It is usual for the architect or engineer who is doing the overall design to have a reasonably complicated drawing with all manner of things shown, including underground utilities, internal walls in buildings, overhead power lines, and fanciful landscaping, not to mention wonderfully ornate borders and title blocks. It is also usual that you are really only interested in bringing a few of these things into CDS. If the CAD operator has placed different things on different layers, then it can make your task simple if you can ask the CAD operator to turn off or freeze all the layers that do not interest you. Even better to get the CAD operator to actually ‘extract’ or copy the layers that do interest you into a separate drawing, and then simply give you that ‘smaller’ drawing to process. 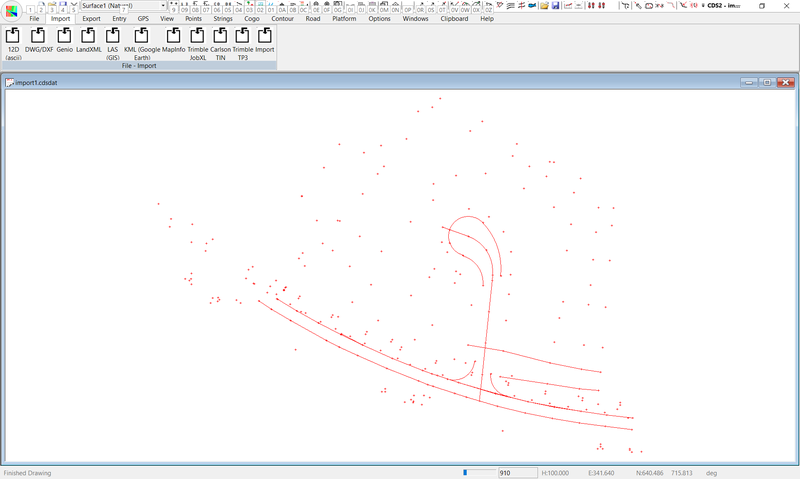 I should also warn you that because of the way in which CAD packages construct polylines, it is quite common for you to get double the number of points which you actually need when the data arrives into CDS. And, as a final note of caution, if someone suggests that they give you a DXF, please ask them if you can have the DWG file instead, as it is considerably smaller in size and therefore quicker to process. OK, enough of the warnings and on with the job. You will have been supplied with a file called ‘lotdwg.dwg’ which is an Autocad® drawing file in which one of your colleagues has designed a proposed layout for a subdivision on the land you have modeled earlier. Select the File menu, and then choose Import DWG/DXF. Use the Browse option to get to the folder \foresite\tutor, and you should see a file named ‘lotdwg’ presented. Select it and open it, and you will now be presented with a screen similar to that adjacent. The first thing you need to do is to actually read through the drawing to determine what information it contains, so select the “Read” button on the bottom of the window. Now the screen will appear as seen below. You will see that a number of layers are listed as being contained in the drawing, but only the one called ROAD is actually checked to indicate that it will be imported. The other layers have been turned off and/or frozen by the CAD operator as I suggested above.Now that you have something to process, you need to give some more consideration to the fields at the top of this screen. It is a good idea to start the point numbering for these new points at a ‘distinct’ number which is either an even hundred or an even thousand for ease of manipulation. Here I suggest that you start from 1000, so enter it in the relevant field. You need to enter a string folder to store the strings in, and a number to start from, and in this case a folder of ‘dwg’ and a number of 1 will suffice. Note: future releases will automatically assign strings to folders with the name of the layer the strings came from, but please enter the folder name to allow them all to be stored together for the time being. Press the Save button and you will find that CDS reads through the drawing again, and this time stores the points and strings into your job. Once the screen re-appears, press the F8 key to turn off the triangles, and the F7 key to turn off the contours and you should be able to see the outline of a cul-de sac. Now select the Layers icon on the toolbar, (or use the F10 key) to access the layers screen, and turn off all layers except ROAD, which is the layer you imported from the drawing.The screen should now appear as seen at right, and you can see a clearer picture of the strings and points you have imported. 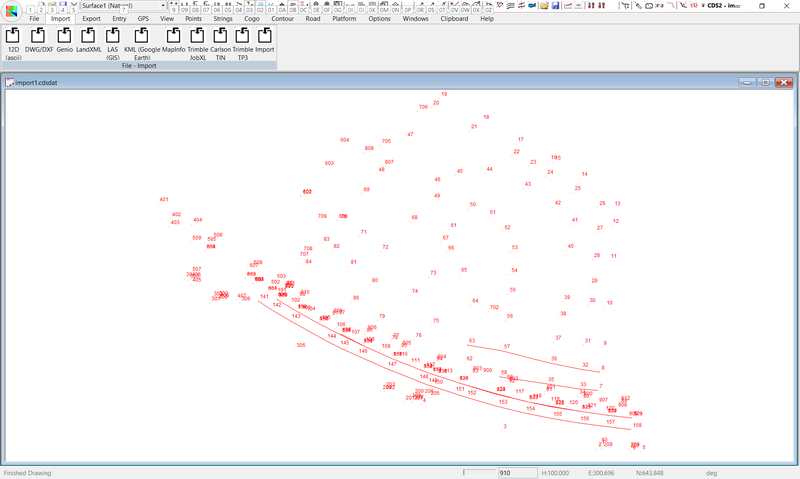 If you look closely at the points, you will see that a number of them appear to be overwritten, and this is due to the ‘duplicate’ points which are often created in CAD packages. Pull down the Options Menu, select QA Routines and then select Filter Duplicate Coordinates. The screen will be similar to that adjacent, and you need to uncheck the box ‘Keep Points Used in Strings, since all of the offending points in this case are in strings. Next you should check the button titled Delete Higher numbered one, since this is the most effective method of dealing with CAD induced duplicates. Press the OK button and the program will go about its task. Once this is completed, you will see that the strings remain in place, but the ‘double’ points have disappeared. You can now use these strings to interpolate profiles and sections across the surface.